After years of training, thousands of hours on golf courses and driving ranges, you have finally reached the top to play in the Golden Tour. Click here to play! Only the very best golfers compete in the Golden Tour, and the winner will walk away with an incredible amount of prize money. While a good golfer won't blame his tools, only a foolish one would think that they have no impact on his play. When you get to choose the clubs you'll use to place the golf ball in the final hole, be careful to pick the clubs that will bring you the biggest payday. Don't let the wildlife get in your way while you play! Gophers are all over the course and your balls could easily fall into one of their holes if you're unlucky. The ducks in the water hazards are particularly aggressive, and the trout aren't too friendly either. A cautious golfer should have no problem handling these critters, however, and may even be able to turn their presence into an advantage. Beer, buggies, golf bags, golf balls and golf clubs � if you can't get enough of golf and golf paraphernalia, then the Golden Tour is waiting for you and your elite golfing skills. Can you take the Golden Tour? Scatter symbols work as bonus symbols. 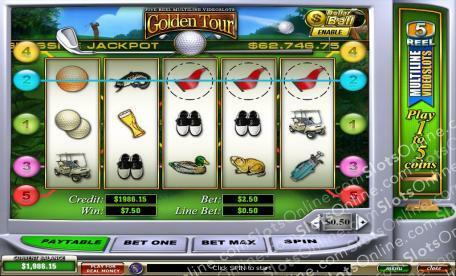 Double golf ball symbols can substitute in combinations for other symbols to win, and also offer higher payouts for multiple wild symbols on the same line. There are three scatter symbols that act as bonus game triggers. When three or more of the same kind of symbol are on consecutive reels, the bonus game is triggered. The bonus symbols are a gopher, a duck, and a trout. The bonus game consists of choosing three different gold clubs and getting paid bonus money based on your choices. Auto Spin may be set to a specific number of spins. It will automatically stop once that number of spins has been reached, but may be stopped manually. Other conditions may also be set such as minimum wins, wins of a certain minimum amount, maximum losses, or when a jackpot is hit.